The last two weeks we explored how both the equipment and the materials can alter the results on the production line. This week we will consider how the staff interaction with the two can affect the process and what to do to ensure a successful conformal coating production process. When considering staff we are talking about everyone involved in the process. That is operators, technicians, supervisors and process engineers. We are going to make a huge assumption that they all need to know the fundamentals of what we are discussing below. After all, would it not be risky not to understand each other’s roles? Lets take a look at each of the areas individually. What to do when a bad result occurs. Sounds logical to know but its amazing how many staff members only know the basics. Understanding the coating process is so fundamental to the system running smoothly. Someone in the process needs to become an expert or what happens when it all goes wrong? Well, people like to tamper with processes and change things. This can be for a variety of reasons, which could be well intended, but as we all know changing the process can affect the results of the coating process. Do staff members understand what will happen when they adjust the process and what will happen there on the system, downstream in the rest of production and ultimately in the field? If not, training is needed. It’s very logical to know this. What is good? What is bad? The staff members need to understand what they are trying to achieve and what are the boundaries that are acceptable and unacceptable. Understand the customer requirements and how that is translated to real life production! Once this is understood then the criteria can be in the form of written instructions and visual aids. They need to be clear, precise and concise. Complex instructions can lead to misinterpretation and lead to failure. Make the guidelines clear and everyone will be happy. Make sure the staff members really understand these points. Then, make sure they obey them! When the coating process goes wrong what do the operators do? Stop the process? Adjust the machine? Change the coating? Do nothing? All are responses that could and do occur. So, what is the right response? Ultimately, I would suggest it is down to how the good and bad results have been defined and the actions to be taken? In summary, training is very important. No one doubts this but is it actually done? 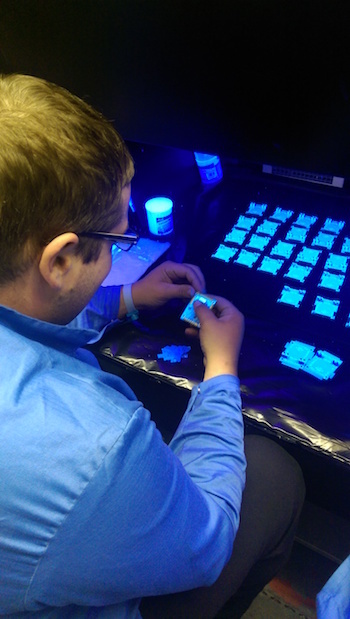 It’s important to carry the training through and ensure the staff member’s knowledge of the conformal coating process is good enough to give the best results in operation. The staff members need to do what they are supposed to do when operating the machine and using the conformal coating. Sounds very obvious, doesn’t it, and we have now taught them this in the training section. However, a lot of problems in conformal coating production are ignored, or not even recognised by the staff operating the machine, and this just makes the problems multiply very quickly! So, we need to do our upmost to enforce the involvement of the operators in taking ownership of the conformal coating process. When the process goes wrong they need to take action and they need to take the right action. How can we help them to do this? We can help them set up the machine correctly. We can give them visual aids and instructions to compare with the results produced by the system. This will aid them to continuously check the process. This is both at the application process and the inspection process. We can ask them to record all the machine data. This can be invaluable for understanding the process long term and predicting problems. They can also record problems occurring so we can trace back the issues. When a problem occurs what do we do? Just record it for the end of the shift analysis? Or, do we feedback the issue and work out why it occurred? This is especially important for inspection where problems suddenly occur and boards are defective. Telling the application operators that defects are occurring helps them correct the issues. Creating monitoring sheets for these defects helps spot the issues quickly for the operators. We can set the process up so that the system can only operate in a certain way and not operate when set up wrong. This can include systems such as bar code monitoring, visual inspection and sensors on conveyors. We can give them warnings when processes go wrong. We can monitor many areas such as material flow changes, material running low, temperature fluctuations, wrong program or circuit board being used or coating and conveyor problems occurring. We can make the machine stop or go into stand by if they occur. So, again there options to help the operators and they create boundaries in which they can operate. The key is to give them unambiguous instructions and guidance that explain clearly what to do immediately there is a conformal coating problem. The third key area is solving the problem when it occurs. So, we have identified an issue. Now what? This is where understanding the conformal coating process is combined with different techniques such as 5 Whys and 8D analysis to really understand the fundamental issues behind the failures. Troubleshooting conformal coating problems is a topic all of its own and can be reviewed in another section of Nexus. We have considered how the staff members can affect the process. When considering staff we are talking about everyone involved in the process including operators, technicians, supervisors and process engineers. The three key areas are training, operation and troubleshooting. Understand what systems are required for these three areas. Implement the systems to ensure your process is optimised for ensuring you achieve the best from your staff members.